Ok, so last week's posts were a little bit downer-y, yeah? I know most bloggers try to make things look all unicorns and kitties all the time, but I do have some serious stuff going on, and I don't like pretending or playing games. So sometimes I've gotta just put it all out there. But I do like to make an effort to be focused on the positive, so I'm going to try to do a list of things that I like/I'm enjoying this week to share with you. Pumking by Southern Tier is out! 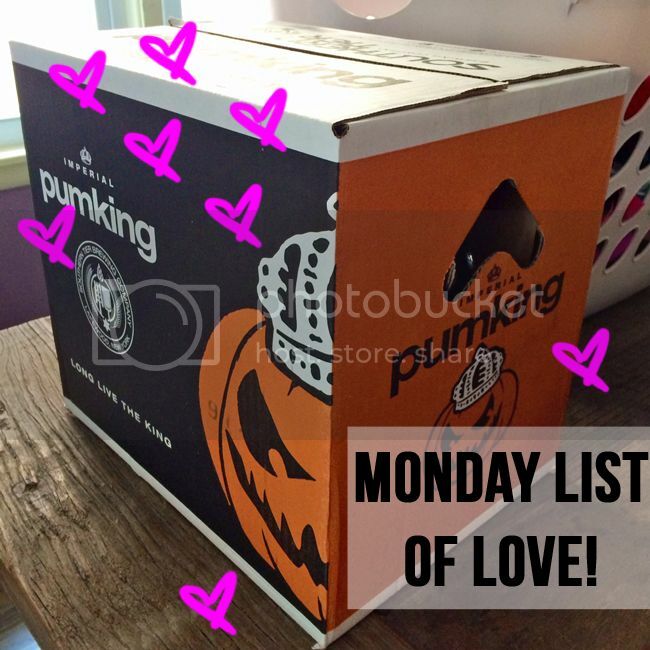 It's my all-time favorite beer, and it's a seasonal pumpkin beer, so I was really excited to pick up a case this week, even though I'm not really supposed to drink after surgery. I'm going to wait and horde it and savor it in tiny bits for special occasions. If you like Pumking, you'll probably also love Warlock. I snagged a couple of these, too. Speaking of pumpkins, Michael's has their Halloween decorations out already! Yessss! We picked up a couple of our all-time favorite scented candles, which are the pumpkin scent (at $4 a jar on sale, the price is right, too!). A couple of weekends ago we had a block party, and I made these neapolitan rice krispie treats. I also made this corn and avocado salad. I added a pouch of microwaveable quinoa from Trader Joe's to the corn salad for an extra bit of protein, and it was really good! I love using my cookbook holder to hold my iPad in the kitchen while I'm cooking up new recipes. Here's a super cute holder from Target. Mine looks like this one, but in black. For rich people, this one's pretty sweet. I've been eyeballing these adorable dresses from LeBomb Shop for a while now. I'm thinking that I might have to pull the trigger on a few (yes, yes, and yes) once I get a feel for what a "regular" size on me might be. Mastodon and Goatwhore both have new albums out. I like metal. These are good.